Electrical tool for measuring RPM and volts. 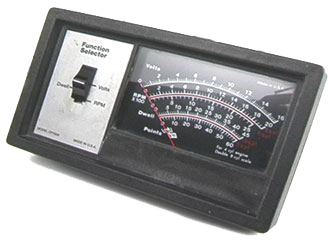 This tool is used to determine rotator dwell, engine RPM at idle, and voltage. It is limited to around 1500 RPMs's but is far more accurate than a dashboard tach. If your car does not have a tachometer to assist you in tuning your idle setting to the recommended RPM, you can install an under-hood version for tuning purposes. It should be a simple connection for engines that have ignitions that use a single coil and distributor setup. One wire to ground and one more to the negative side of the coil.